Attention architects and urban planners: A team of researchers in the UK has investigated the relationship between our health and the beauty of the environment we live in. The team’s conclusion: People feel healthier when they live in a more scenic area and it doesn’t have to be green. 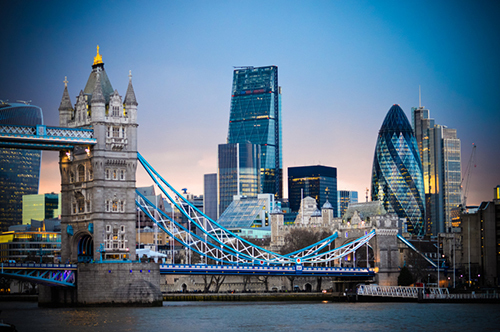 The study conducted by a team of researchers at the Warwick Business School in Coventry, England, shows a link between architecture and health. The researchers from Warwick Business School reported their findings in a study, “Quantifying the Impact of Scenic Environments on Health,” published in Scientific Reports. They found that the link holds true across urban, suburban and rural areas of England, and cannot simply be explained by the income of local residents, or how green an area is. To arrive at these findings, the researchers used crowdsourced data from an online game called “Scenic-Or-Not,” where players have rated the “scenicness” of more than 212,000 images of Britain, according to a research announcement. More than 1.5 million ratings were collected, the researchers said. The team then combined the game data with figures collected from the 2011 Census for England and Wales, where people reported their general health as “very good”, “good”, “fair”, “bad” or “very bad”. 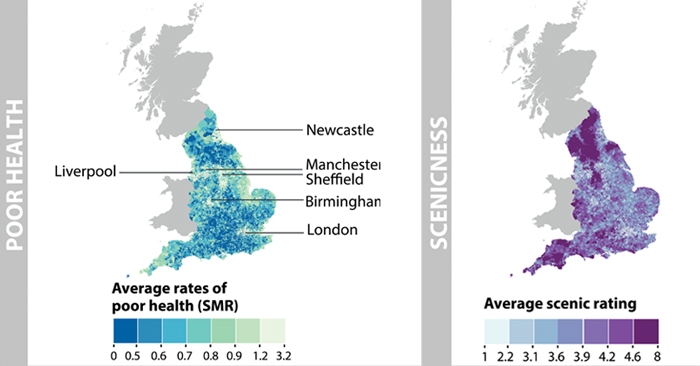 The team plotted ratings of health and scenicness across England using research data. The researchers discovered that people who lived in areas rated as more scenic reported their health to be better, when answering a question about their health in the 2011 Census. “Just because a place is green does not compel us to feel better on its own,” Chanuki Seresinhe, a Ph.D. student in the Data Science Lab at Warwick Business School said in a statement. “It seems to be that the beauty of the environment, as measured by scenicness, is of crucial importance. “We also found that the most scenic photos do not contain the highest proportion of the colour green. “Our findings imply that simply introducing greenery, without considering the beauty of the resulting environment, might not be enough,” she said.